It has probably escaped no-one that things are heating up along the 38th parallel in Korea. All began when earlier this month (04.08.2015) two South Korean soldiers were wounded by landmines placed by the Democratic People’s Republic of (North) Korea (which certainly doesn’t warrant any of those titles, except ‘Korea’). Last Thursday (20.08) the DPRK fired artillery over the demilitarised zone, DMZ for short, aiming on propaganda loudspeakers set up by the Republic of (South) Korea, which promptly answered with a few salvos of 155 mm long range artillery. This evening (24.08) there seems to have been some sort of agreement reached, but the situation remains tense. This warrants a few observations. North Korea is quite possibly the most militarised country on the planet. A large part of its equipment, including vehicles and weapons, are old bordering on antique. This includes fighter jets developed in the 50’s and apparently tanks that saw service in WWII (if rumours about T-34’s and Su-100’s still being active are correct). Still, while the main force would rely on numbers more than quality in any renewal of fighting, there are a couple of branches that may make things nasty for the South. The first is the North Korean artillery. The number of artillery pieces, calibres ranging from 3’’/76.2 mm up to 170 mm, are unknown, but is measured in thousands, possibly up to 10,000. Some of these are stationed in hardened shelters dug into the mountains along the DMZ, reportedly with pre-determined targets on the Southern side of the border, including Seoul in the case of the mighty (but slow-firing) 170 mm Koksan self-propelled gun. Added to these are a few thousand (4-5,000?) multiple rocket launchers, as well as thousands of light, medium, and heavy mortars. The lethality of these are somewhat overrated, with graphic descriptions of Seoul being levelled by a wall of fire during the first hour of a possible conflict. In practice, only the heaviest systems, 200 mm rocket launchers and the 170 mm guns, have the range to reach Seoul, and due to their size they have a very long reload time. Also, the use of fixed positions makes them easy targets for the sizeable air force and artillery units operated by South Korea and the US forces on the peninsula, the main mission of the latter being counter-battery fire. However, the sheer number and protection of these gun emplacements mean that their destruction will take time, and while a Dresden-style complete destruction of Seoul is out of the question, they will still cause considerable damage during their short life spans. Another much reported arm of the DPRK forces is the submarine fleet, which is one of the oldest and largest in the world. It is mainly made up of old Chinese copies of the obsolete Soviet Project 633 ‘Romeo’-class diesel-electric submarines, around 20 of which are currently in service. These are then backed up by a plethora of smaller vessels of the Sang-O/Sang-O II, Yugo, and Yono-classes, which are either used for insertion of Special Forces or for “traditional” ship-hunting missions. 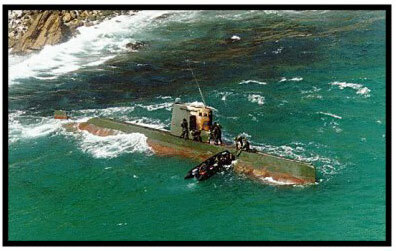 The latter was demonstrated when a Yono-class submarine fired a torpedo that sunk the South Korean corvette Cheonan back in 2010, becoming only the third submarine to have sunk a surface vessel since the Second World War. The US Naval Institute claims that as many as 90 of these smaller vessels might be in service, but also notes that serviceability is poor and many vessels are in reserve. Yesterday (24.08.2015) South Korean sources reported that 50 submarines of unspecified classes have gone to sea in an unprecedented move, and that these make up 70% of the entire submarine force (i.e. the ROK places the number of active submarines at 71 compared to USNI’s ~110). In response, South Korea has stepped up its air patrols to try and locate the submarines. While the submarine force is severely outdated, the Romeo is largely based on a hull-design pioneered by the Germans during WWII in the form of their Type XXI coupled with early-Cold War Soviet technology, they should not be underestimated. Diesel-electric submarines are extremely quiet, and as such hard to detect. If the submarines are able to take up positions before a conflict erupts, as their sheer number means that it is impossible for South Koreas 16 anti-submarine aircraft to keep track of them all. Even many of the lighter submarines feature heavy 533 mm torpedo tubes, being able to load a number of different Chinese and indigenous torpedoes, including wake-homing and passive/active seekers, making them extremely deadly if they can lie silently in ambush and wait for a target to pass by, as was evident in the case of the sinking of the Cheonan. All in all however, the South Korean armed forces should be able to make up for their smaller size by vastly more modern equipment and training. There are uncertainties, such as the morale of the conscripts serving long times in remote (and unpopular) locations, and the whole system of conscription has been questioned. Still, in a fight for the survival of the country, one would assume that morale would not be an issue. The big problem with Korea is that it is next door to China. And that there are a considerable number of US troops in the country. As was evident in 1950, while China might not be overjoyed by the seemingly dicey behaviour of their neighbours in Pyongyang, they vastly prefer it to having an US ally on the border. In fact, the response during the Korean War was so strong, it was one of the very few instances since the Second World War in which an US force have been decisively beaten on the battlefield. Still today, it is hard to imagine Beijing letting Pyongyang fall, no matter their opinions of Kim Jong-un and his regime. Obviously, there is also the issue of North Korean nuclear weapons. They don’t have many, but even a single warhead aimed at Seoul, or any other target on the peninsula for that matter, would in a stroke transform the conflict. Some have stated that the treat of the US nuclear arsenal and a retaliatory attack by Washington makes this option unlikely, but I am less than certain. To begin with, Obama has so far proved to be a leader that likes to err on the side of caution in matters of foreign policy. Also, whether there would be a popular opinion in the US supporting even a defensive nuclear war on the Korean peninsula is highly dubious, especially with the possibility of the Chinese being dragged into it with their nuclear arsenal. It might however be that Washington has no choice. With the amount of US troops in the area, there is a very real risk that they will be dragged into the fighting, and suffer casualties, before Obama even has time to gather his aides to discuss the war. This was followed by a huge fire at a nearby steel plant, which closed Tokyo’s Haneda Airport.